The deadly blast that ripped through the Abu Fazal shrine in Kabul took place in Murad Khane, one of the oldest and poorest districts of the city. 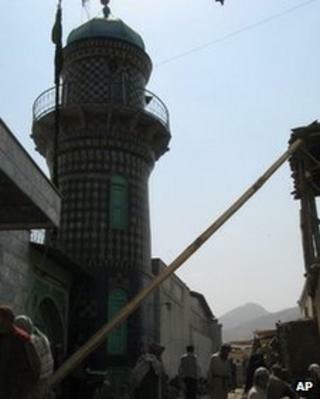 The shrine is not one of the city's biggest, but is well known in Kabul, especially among the city's Shias, and its distinctive blue minaret is a landmark in the area. Murad Khane is a residential area of pale mud brick buildings on the north bank of the Kabul river, and has an ethnically mixed population, including many Shias. The area was established in the 18th Century and is part of the historic heart of Kabul. The Abu Fazal shrine lies just a few hundred metres from the presidential palace and the ministry of finance. Once a bustling business hub, Murad Khane has become neglected in recent years, with residents complaining of rubbish-strewn streets and poor drainage. Some government officials have even raised the possibility of demolishing the area. Charities like the Turquoise Mountain foundation have been working to preserve and renovate the area's architecture and traditional crafts. The shrine itself is said to be named after named after an adviser to a 16th Century Mogul emperor. On the festival of Ashura, the shrine is one of the many places where processions are held by Shias, with religious songs and men flagellating themselves in mourning of the martyrdom of Hussein, the Prophet Muhammad's grandson. Why have Afghanistan's Shias been targeted now?